How to save or download emails from any account - Datamaton Inc.
We often have useful information in emails and need to back them up. While there are many file backup tools, there aren’t many apps that allow you to save or download emails from any account. Blob is one such useful tool, allowing backup of messages from one email account to another, or as files to your computer or to cloud storage. You can save or download emails from any account using the same procedure (e.g. from Gmail , Apple iCloud mail, Micorosft mail etc.). You can copy or move messages from one email account to another. For example, you can directly copy an email from your Microsoft Live Mail account to your Gmail account. You can download emails as files. The copy target can be a local drive on your computer or a remote cloud storage location like Google Drive, Microsoft OneDrive etc. The email copy is high-fidelity. 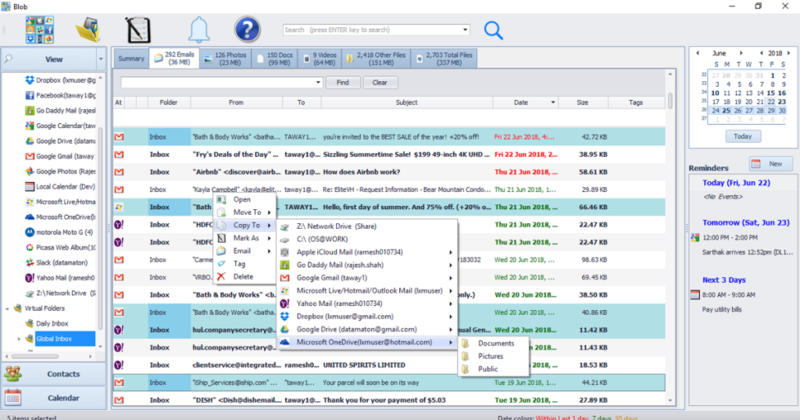 It retains the original values for email sender, recipient, date, attachments etc. File copies are in standard ( eml ) formats. Many free programs like Windows 10 built-in mail app, Mozilla Thunderbird etc. can open eml files. You can save sensitive emails as compressed and encrypted ZIP files. Many free tools like 7zip, Windows 10 itself etc. can open zip files. If you haven’t done this already, first add your email Data Source to Blob so it can index it. After Blob has indexed your email account, you can double-click on it to display its contents. The “Email” tab on the right will show all your emails. If you select the email account name in the left pane, you will see all emails from all folders in that account. If you select a specific email folder in the left pane, you will see emails only from that folder. 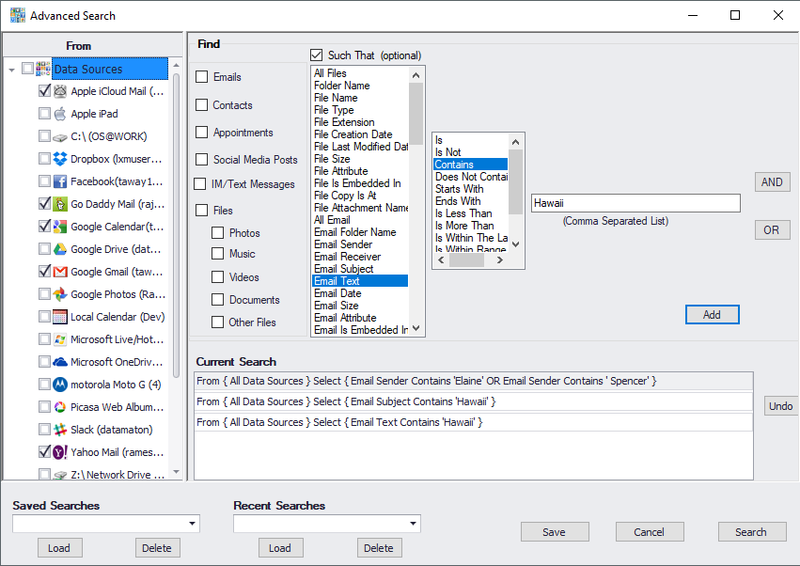 To make it easier to select emails with a given sender/receiver name, with a specific subject etc., you can sort on that property by clicking on that column’s header (Folder, From, To, Subject, Date, Size etc. as shown below). Then, simply select all the emails you want to save and right-click to open the menu. Click on the “Copy To” menu option and select the target location where the messages should be saved. If you already have a virtual folder (e.g. “Global Inbox”) that lists the emails you want to backup, simply double-click on it. Then, select the ones you want to backup from the list of messages in that virtual folder. Right-click on the selection, click on the “Copy To” menu option and select where the messages should be saved (as shown in the previous picture). Open Blob’s advanced search by clicking on the search icon. Add the email selection conditions you want, and click on “Search”. When the search results window appears, select the emails you want to copy and use the “Copy To” menu option to copy them (as shown previously). If you want to save/download emails on a regular basis, you can set up a task to do it. When you create the task, it will allow you to specify which emails to backup as shown below. 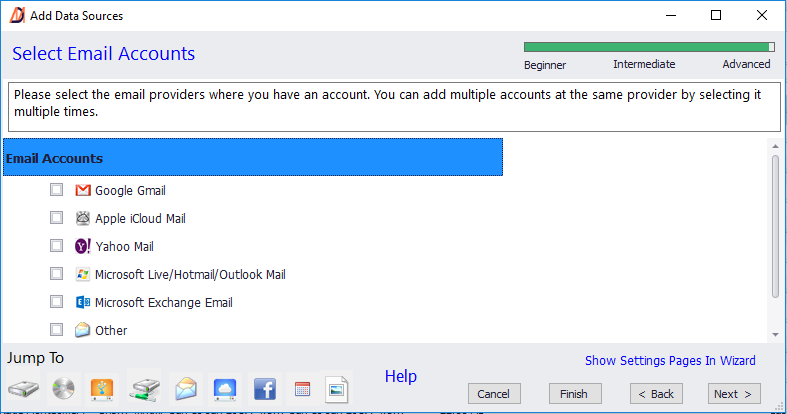 You can choose to copy emails from a single email account/folder, or from multiple accounts. As the picture above shows, you can select emails to be backed up from an email account or from a Blob virtual folder. 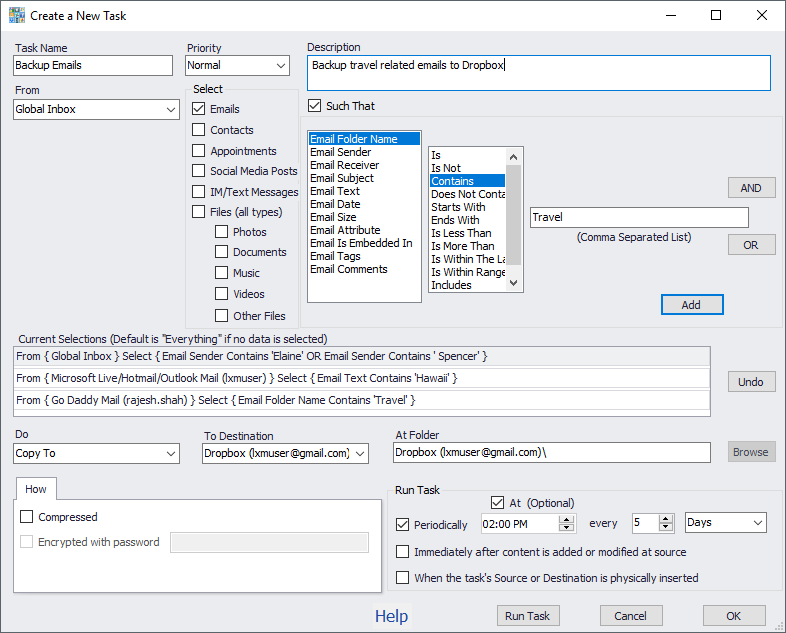 Once you have selected to emails to copy, specify how often the task should run and where it should copy the messages.